What are the requirements of Germany EU Blue Card? 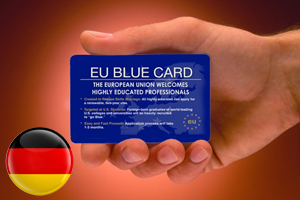 Germany EU Blue CardGermany EU Blue Card gives an opportunity for highly qualified skilled professionals of non-EU states to work and reside in the European Union. Get ready to apply for a Germany EU Blue Card if you meet the below requirements. Family members of Germany EU Blue Card are authorised to work in Germany without any restriction. It is not mandatory that the spouse has to speak German. Applicants interested in working in Germany under EU Blue Card have to file their applications for a work visa at the embassy or the consulate of one’s own country of residence with the arranged required documents according to the checklist and photographs and then followed by a scheduled appointment at the German Embassy. Following the grant of the work visa by the embassy, the applicants will be given an EU Blue Card upon fulfilling the Germany EU Blue Card Eligibility as stated above.